March 12, 2019. Josue Quintero rang the closing bell at the New York Stock Exchange because of his role as the Junior Achievement Student of the Year! April 17, 2018. Sadeiki L. and other BPHS students in the College Summit Peer Leaders program got the chance to ring the opening bell on Wall Street! August 4, 2017. Elaine A. and Tanzida A. were awarded a $5,000 check for their hard work advocating for The New York Foundling Organization. Brooklyn Prep partners with The Youth Philanthropy Initiative to provide students opportunities to research and compete on behalf of a charity of their choice. Congrats! JUNE 16, 2017. BPHS 11th grade student, M. Garcia, created a PSA on immigration for Reelworks. Check it out! FEBRUARY 8, 2016. 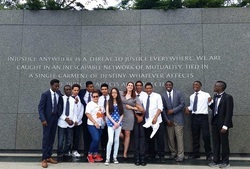 Brooklyn Prep was highlighted for the extracurricular and service learning hours our students do in activities like Young Lawyers Club and Youth Philanthropy Initiative. JANUARY 15, 2016. Brooklyn Prep students in the Leadership and Mentoring program were featured on Pix 11 for National Mentoring month! Brooklyn Nets visited the school and congratulated BPHS students on their hard work. JANUARY 25, 2016. BPHS students have been invited to attend coding "Hack Camps" and numerous extracurricular opportunities in STEM fields. See one of our students, Keven Marcareno, talk about his experiences in this clip from Enza Academy.